In the last post ★ “Back to the Basics” – God’s Mysterious Plan Revealed ★, we talked about the importance of going to church because God’s plan is to use the body of believers to display His character and to meet the needs of those who are hurting and under resources. We also talked about how in Hebrews 10:24-25 we are instructed to motivate one another and not neglect meeting together, as some people do. I had some good discussions with people since that post asking, “What about meeting in small groups or one on one with other believers?” So I thought I would explore that in today’s Thought. The timing was impeccable, as I was asked to share at a Men’s Breakfast yesterday about my experience with meeting in small group settings. So part of this post will be the testimony of how God has worked in and through me as I have focused on building community that matters. I am not sharing this so that you would think highly of me but rather to show how awesome God in how He is using this broken man to reach as many people as I possibly can. On Wednesday nights my wife and I are part of a Lifegroup from church which is a meeting with 10 other people that we “do life together” and study God’s Word. The purpose is to build biblical community so that when the storms of life hit (and they will,) there is a group of people who are “waiting in the wings” to come alongside and help you. Another opportunity to build community is to have a small group bible study or what my church has called a “Fight Club”. Unbeknownst to me, this would radically change me, and awaken a fire in me for biblical community. And I would encourage you to pray it daily too! 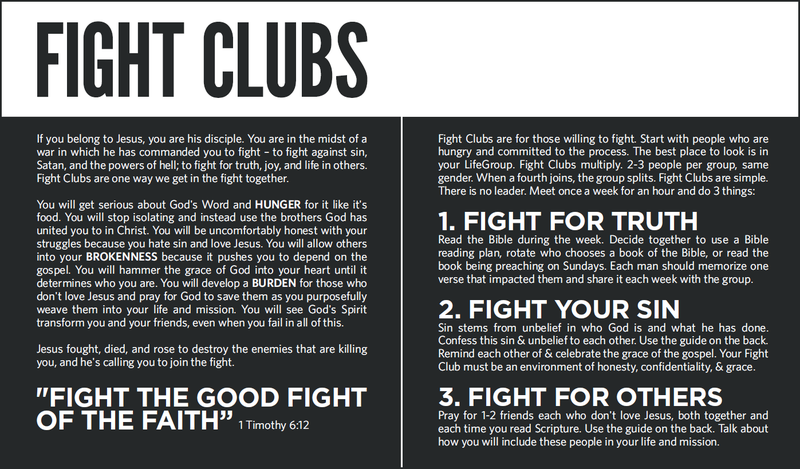 Fight Clubs can be or Women or Men who want to deepen their relationship with God and with other believers. 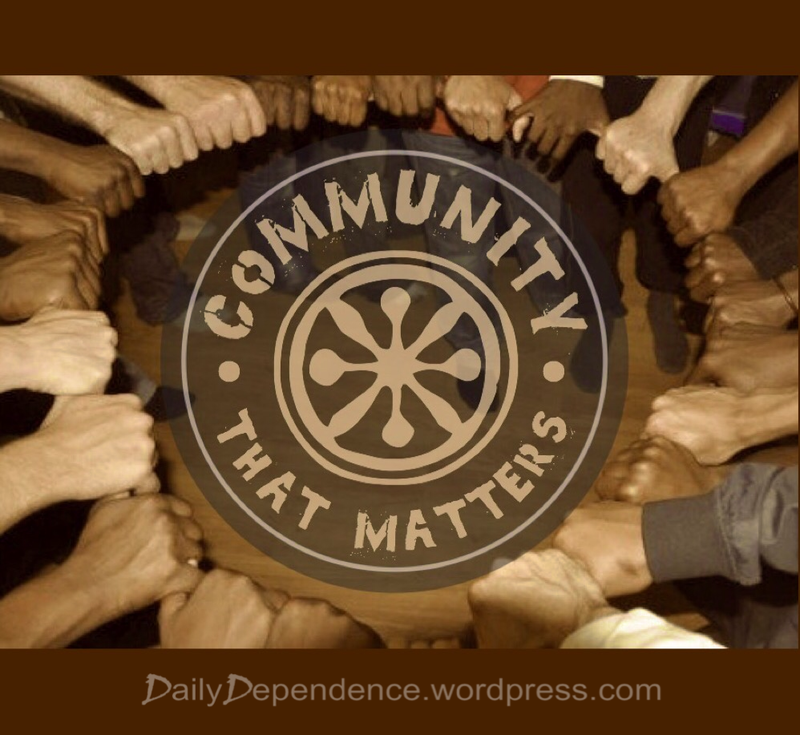 For me it obviously revolved building a biblical community with other men, something that I always wanted but had escaped me until June 6, 2016 was when I was first introduced to the idea of a Fight Club. We formed the first Fight Club I was a part of from the guys in our Lifegroup since we knew each other already. It was great gathering with these men because it was the beginning of something that I always wanted in my life…to be part of a brotherhood! We met through the summer until our schedules changed. Then our group multiplied from 1 to 3 groups as we disbanded and formed new ones. Since then I’ve been meeting with 1 to 2 other guys on Thursday mornings for breakfast as schedules have permitted. As we have built biblical community together, I realized the need to reach out to as many men as possible but just did not know how to accomplish within an already busy schedule of balancing my work and home life. In the post, ★ Back to the Basics – Silencing the Noise ★, we delved into the importance of developing a quiet time with God each day. For the past 6 years I have made a practice of starting my quiet time at 4:30 am before my wife and kids get up. You may be thinking, “4:30 in the morning that is crazy!” But I have found in my life, unless I prioritize reading and studying the Bible in my day it won’t get done. As I have prayed for God to give me “a burden for people” several of my good friends in my neighborhood came to mind so I offered to do a Fight Club with my neighbor at 5 am since he was only two doors down and shockingly he agreed. We have been meeting since August 2016. When we started, he was in a good place in regards to already attending church services and a part of a lifegroup but like me, he didn’t have a close connection with another guy either. We had a good friendship but through the Fight Club it has reached a deeper level as we have shared our lives and struggles together. Last November he received the terrible news that the cancer he thought he had beaten was back. The Fight Club created the opportunity for me to support him as he is now battling Stage 4 liver cancer. I am thankful that God has given me the privilege to walk alongside of him during this dark time. That would not have happened if I had not invited him in the first place to study the Bible with me. But the testimony doesn’t end there. My oldest daughter has a friend who needed help with some issues he was going through. We met at Starbucks back in September 2016 and I shared my testimony with him of how God delivered me out of the same darkness he was in. God used my past mistakes to open the door to connect with this 15-year-old. Since then we have been meeting after school on Fridays for a Bible study which has included my daughter and another neighbor’s son as well. I know by the rules of the Fight Club, she should not be a part of so we will just call this a Bible Study…hahaha! On November 6, 2016, my daughter’s friend attended Sunday morning service for the first time. When the Pastor opened up the altar for prayer, he went down and accepted Jesus as his Savior! He now attends the student services every Wednesday night, Sunday morning services and volunteers in the children’s ministry. He is in fire for God and has been inviting his friends from his former lifestyle to church and our Friday afternoon Bible study including his former drug dealer! That would not have happened if I had not invited him in the first place to study the Bible with me. But the testimony doesn’t end there. This past December, I started meeting with a friend from church at 5 am on Friday mornings to study the Bible. 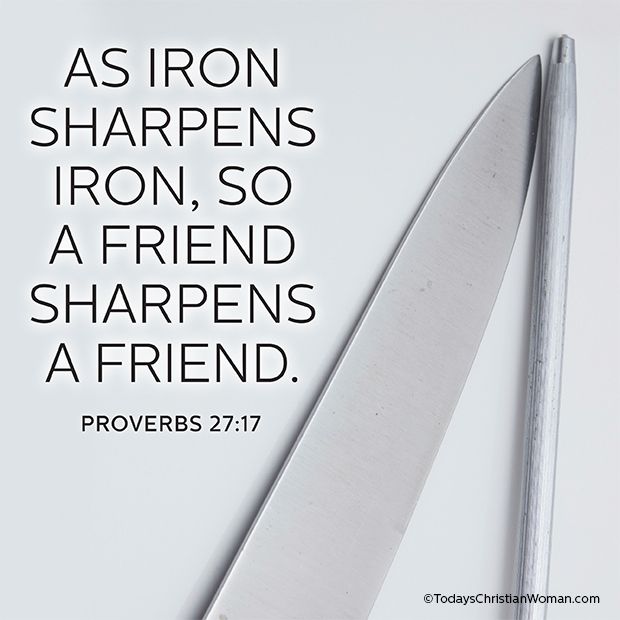 As I mentioned earlier, we all need “sharpening” in our walk with God (Proverbs 27:17). Sometimes you are doing the sharpening (as a mentor) and sometimes you are sharpened (as a mentee or with someone who is a peer.) In this case it is the latter and it has been amazing to see how he has strengthened me and our friendship has grown. And then just two weeks ago, two more guys started coming over my house before the sun rises as well…Another friend from church that will certainly be sharpening me and another neighbor of mine who is just engaging with the Bible for the first time! My hope and prayer is that every single morning I will have another man across the dining room table from me studying God’s Word! You never know what God can, and will do through you when you participate in a Fight Club! That is of course; if you are open to being used by Him. If you are reading this today and feeling insecure about sharing your life with other people, I want to encourage you with one of my favorite quotes that is so true! There is nothing special about me, but God is clearly doing something through me as a result of being open to be used by Him. How else can you explain 4 guys being willing to meet at 5 am to study the Bible? You never know the ripple effect that can happen in the life of that person you reach out to. God can exponentially multiply your impact for generations if you will trust Him today, and take a step of faith to start a Fight Club on your own! And just to calm your nerves it doesn’t have to be at 5 am, that’s just when I have decided to have mine. Hahaha! 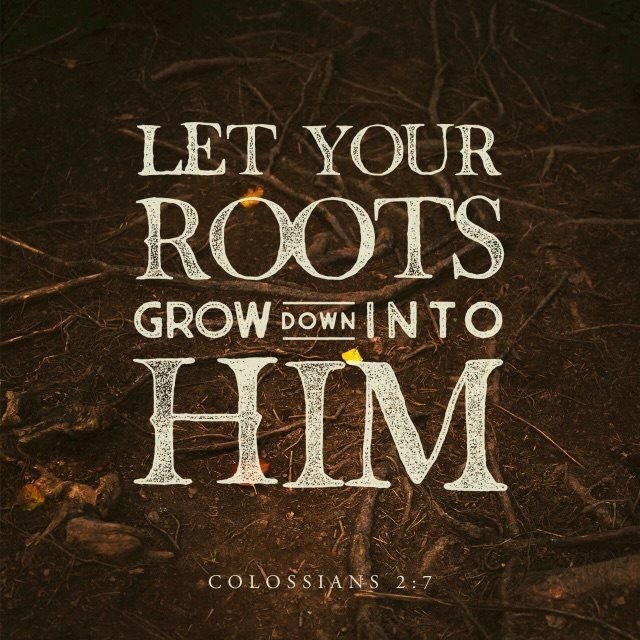 As you let your roots grow down into Jesus and you come closer to Him through the reading of His, God to change your heart and you will have “A HUNGER for God’s Word. A BROKENNESS over sin. 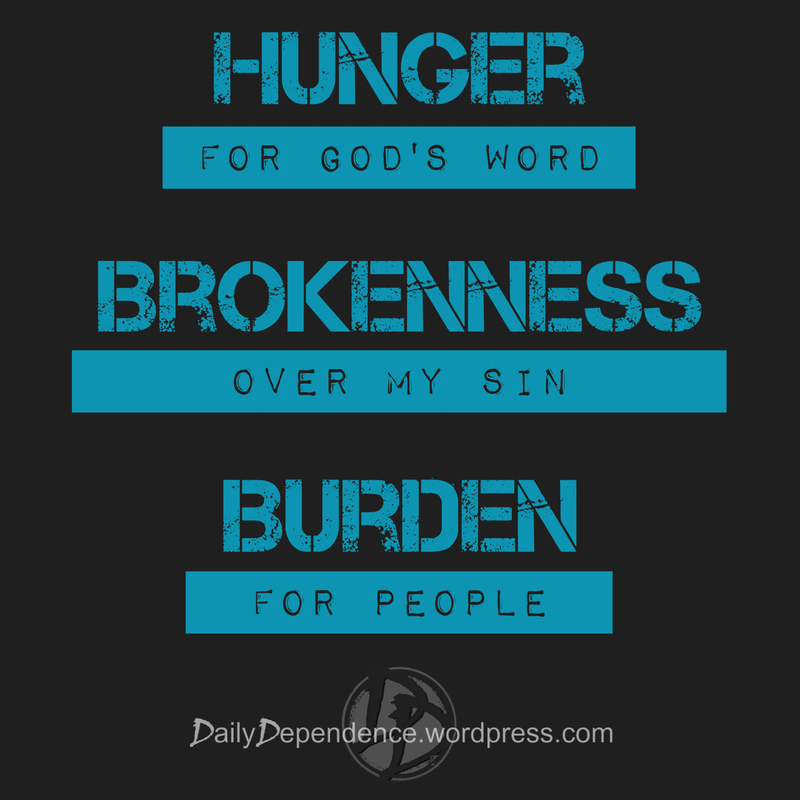 And A BURDEN for people.” The Bible is the Path to Life! Also here is an incredible message that talks about how critical it is to build biblical community! It is appropriate time to make some plans for the future and it’s time to be happy. I have read this post and if I could I desire to suggest you some interesting things or suggestions. Maybe you can write next articles referring to this article. I want to read more things about it! I am so glad that you like this post! I will definitely look to expand on this topic as it is critical for our development! God bless! Nice post. I learn something new and challenging on websites I stumble upon everyday. It will always be useful to read through articles from other writers and use a little something from their sites. Tremendous issues here. I’m very happy to peer your article. Thanks so much and I am taking a look ahead to touch you. Will you please drop me a mail? Thank you so much for those kind words!! I am glad to hear that God is using what he gave me to speak to you!! You’ve made some decent points there. I checked on the net for more information about the issue and found most people will go along with your views on this web site. Thank you!! All the glory belongs to God! I write what He places on my heart!! I hope you will come back often. Thank you so much for those kind words!! I am glad to hear that God is using what he gave me to speak to you!! I have been blogging since August of 2014. I appreciate the feedback on the look of the site, WordPress makes it really easy! Excellent blog! I wish to apprentice while you amend your website, how could I subscribe for a blog website? The account helped me a acceptable deal. I had been a little bit acquainted of this your broadcast offered bright clear concept. You can get new posts delivered straight to your inbox. All you need to do is go to DailyDependence.WordPress.com ON YOUR COMPUTER, not phone, and click “Follow” button on the bottom right corner. Enter your Email Address and you will never miss a post! God bless!! in %BT%. I just read what you may wrote about any of it. However I currently have several left unanswered conundrums. Are you able to offer assist? Sure. My email is DailyDependence@gmail.com. I am not longer certain the place you are getting your info, however great topic. I must spend a while finding out much more or working out more. Thank you for fantastic information I used to be on the lookout for this info for my mission. Thank you so much for those kind words!! I am glad to hear that God is using what he gave me to speak to you!! All that I write comes from the Bible first and foremost and then some supplemental sources. If you have been blessed by our site, would you consider sharing our blog with your connections? 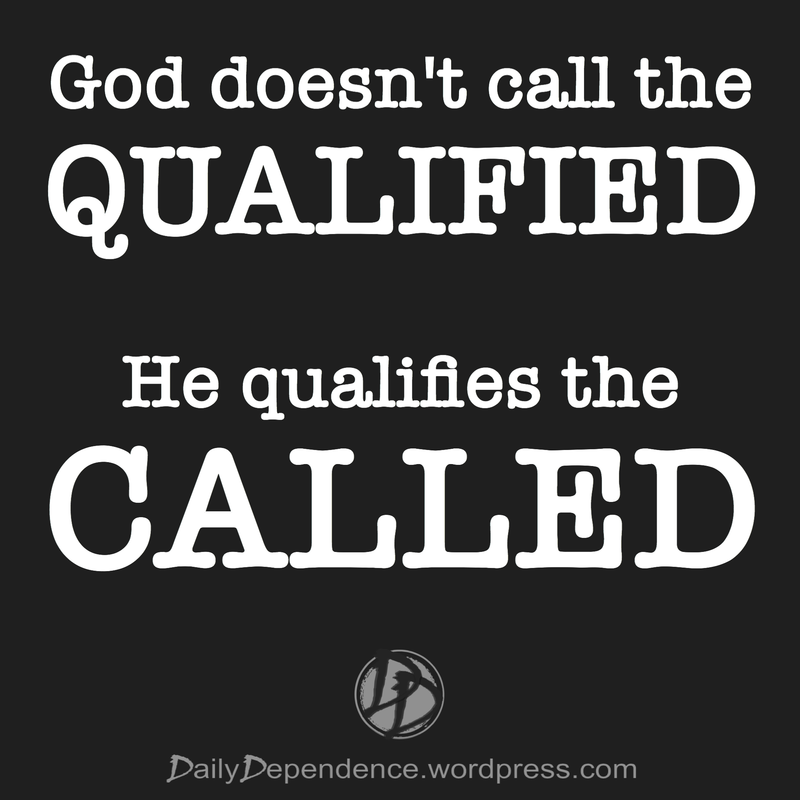 This is all for the building of God’s Kingdom! By the way if you are interested in keeping up with what we are posting, it is really easy. You can get new posts delivered straight to your inbox. 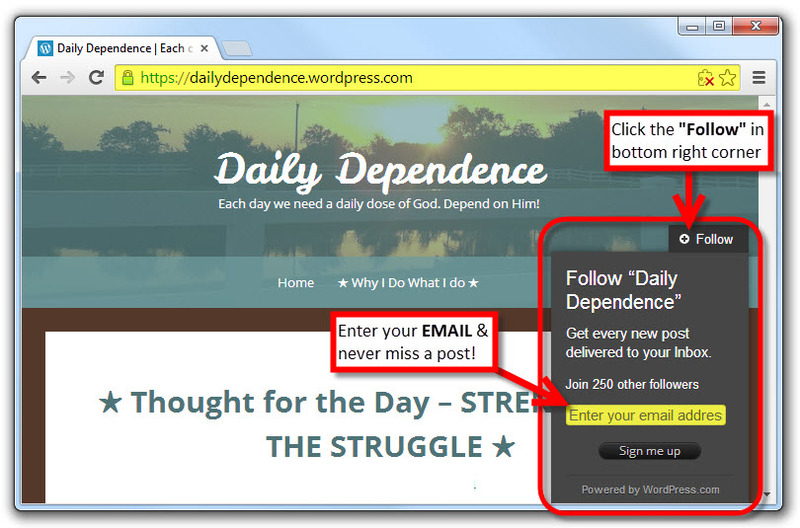 All you need to do is go to DailyDependence.WordPress.com ON YOUR COMPUTER, not phone, and click “Follow” button on the bottom right corner. Enter your Email Address and you will never miss a post! You’re so cool! I do not think I’ve truly read something like that before. So nice to discover someone with unique thoughts on this topic. Seriously.. many thanks for starting this up. Thank you so much for those kind words!! All the glory belongs to God! I write what He places on my heart!! I wanted to ask you a favor. If you have been blessed by our site, would you consider sharing our blog with your connections? This is all for the building of God’s Kingdom! I hope you will come back often. God Bless! You’re so cool! I do not think I’ve truly read something like that before. So nice to discover someone with unique thoughts on this topic. Seriously.. many thanks for starting this up. This website is one thing that is required on the internet, someone with a bit of originality! argue with you (not that I personally will need to…HaHa). You certainly put a new spin on a topic that’s been written about for ages.